This Wednesday in the Bird Division prep lab, was a busy one. There were a at least 5 to 6 volunteers in working on various projects. It was a pretty busy, gregarious atmosphere. And although sometimes it seems to spiral to levels that threaten concentration, I find it to be a welcome anecdote to my quiet home studio. Many of the volunteers are retired and well into their 60s, but they tend to be the raunchiest repeat offenders in terms of general levels of silliness. This week there was a bit of a coup in the prep lab. 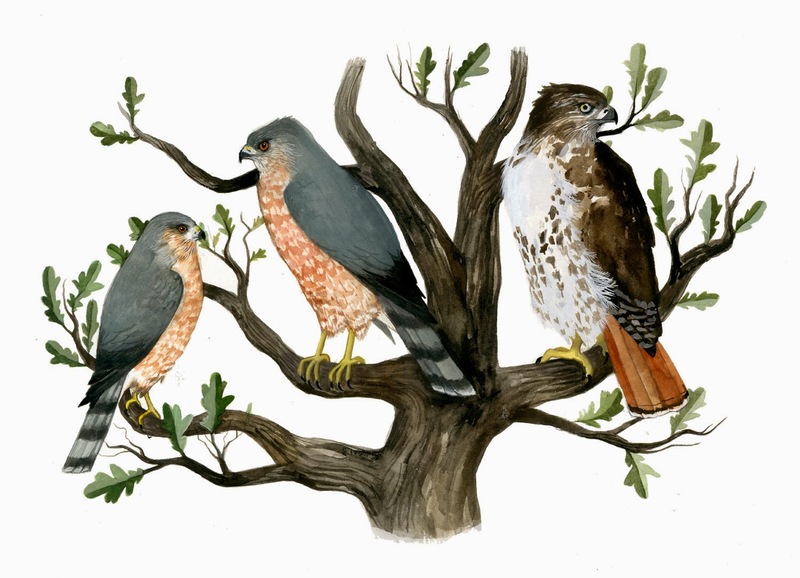 When birds come into the lab, they are cataloged and then sorted as far as if the specimen will be made into a study skin, or will be prepared to be made into a study skeleton. You can't obtain both from one bird, it has to be one or the other. So, when I arrive in the morning there are usually several birds set aside for me and the other skinner to prepare, and on a separate table there are many birds that have been set aside to be made into skeletons. Birds being made into skeletons have to have all of their feathers removed first, before their tissue can be cleaned away by dermestid beetles. This Wednesday, one of the birds awaiting to be made into a skeleton was a tiny, lovely, Henslow's Sparrow. I had never seen one so close before. I was somewhat familiar with them as the location where I used to bird on a regular basis, Glacial Park in northern Illinois, was rumored to have a breeding population of this somewhat rare, inconspicuous sparrow. 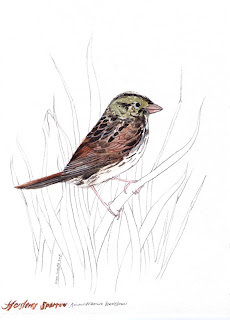 They're a secretive species, that are not easy to spot due to their preference for weedy fields, and are easily confused with similiar species: Grasshopper Sparrow, and LeConte's Sparrow. Often times a bird will be made into a skeleton because the bird's plumage has been damaged in some way. This little fellow, however, was in perfect condition, and as a result there was a wave of gentle outrage amongst the volunteers as to its fate as a skeleton. Granted it was something that had been frozen since 2005, and this can sometimes lead to freezer burn and complications in terms of removing the skin without damage. Dr. Willard had set it in the skeleton pile for this reason, and he felt the collection could really use a Henslow's skeleton more than a skin. He was eventually cajoled by our shear numbers to think otherwise, and I was allowed to create a study skin of it instead. He was later heard grumbling "I am quickly losing control of my lab!" 2 new paintings posted to the Etsy shop: Henslow's Sparrow and Pine Grosbeak. Lovely job on the Henslow Sparrow. Your story about the ornithology lab was fun too. It's an odd time to be posting, I realize. I've just come in from several hours of backyard astronomy -- the first opportunity I have had this year to do much observing. The weather in KC this spring has been terrible from an astronomical perspective.